Ham Holiday 2015 . . .
ARRL Complains about Home Depot Ballasts . . .
Ham College Episode 4 . . .
Ham Holiday is THIS WEEK. 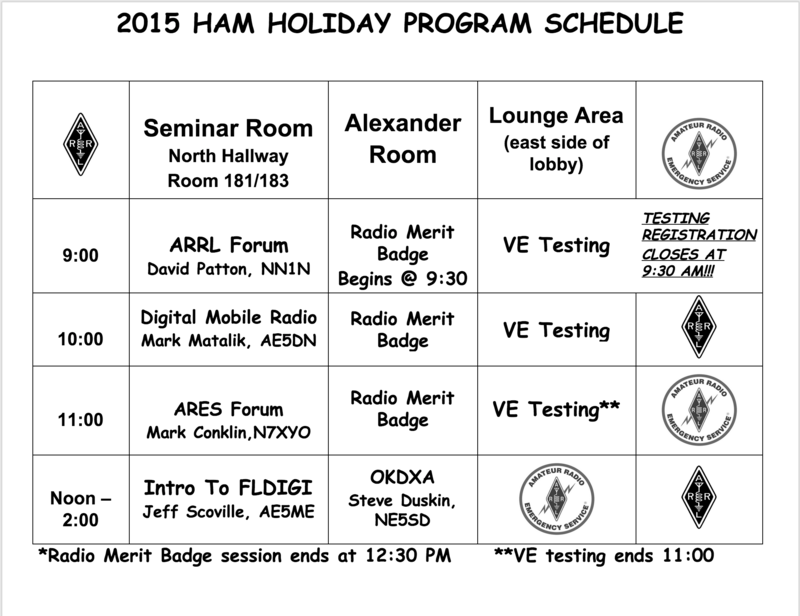 You won’t have to drive 100 or 200 miles to go to a great HamFest. Here is info, schedules, and more. Don’t just skim this article! This MAY VERY WELL be the cause of some of your HF noise!!! The ARRL has filed a formal complaint with the FCC, alleging that The Home Depot home improvement chain has been illegally marketing certain RF-ballast lighting devices in violation of FCC Part 18 rules. Accompanying the League’s July 14 letter to FCC Enforcement Bureau Spectrum Enforcement Division Chief Bruce Jacobs and Office of Engineering and Technology Laboratory Division Chief Rashmi Doshi was a 20-page report prepared by the ARRL Laboratory’s Mike Gruber, W1MG. His report outlines four instances in which The Home Depot sold non-consumer-rated RF lighting devices having far greater emission limits and intended for commercial use to consumers who specifically voiced an intention to use the devices in residential settings. In some cases, information included with devices sold to consumers indicated that they were for commercial use only, but not all products sold included such a notice. In its letter, the League noted that it has received numerous complaints from the Amateur Radio community of “significant noise” in the bands between 1.8 and 30 MHz from so-called “grow light” ballasts and other RF lighting devices regulated under FCC Part 15 and Part 18 rules. “These devices are easily capable of emitting RF noise sufficient to preclude Amateur Radio MF and HF communications (and as well, AM broadcast station reception) throughout entire communities and at distances of up to ½ mile from the device,” the ARRL said. According to the League, its investigations in several states revealed an alarming number of instances of retail sale of electronic lighting ballasts, in which non-consumer-rated ballasts were mixed in with consumer ballasts and other consumer products. Gruber’s report noted that the conducted emission limit for consumer-rated devices are 22 dB lower than their commercial counterparts for all amateur bands below 30 MHz. “In most of the stores surveyed, unsuspecting consumers have no way of knowing the significance of consumer vs. non-consumer ballasts,” the League said. “In some cases, ‘commercial’ grade ballasts, with their associated non-consumer emission limits, appeared to be a heavier duty or superior product. The display signage typically used implies, therefore, that commercial ballasts are also a product upgrade for home use.” The ARRL said that store display signage typically did not mention or adequately address applicable FCC Part 18 requirements, as they pertain to interference in a residential environment. The League said that in the four instances where actual purchases of RF lighting devices were made at The Home Depot retail outlets, purchasers “specifically asked about residential deployment of non-consumer RF lighting ballasts.” The ARRL said it’s apparent that The Home Depot — and, by inference, other similar retail stores — is “actively and knowingly engaged” in selling commercial RF lighting products to customers for use in residential environments. “If this activity is left unchecked the Commission will continue to note a deterioration in ambient noise levels and preclusive interfering signals for both AM broadcasters and Amateur Radio licensees in the entirety of the high-frequency bands,” the League’s complaint said. A copy of the letter was sent to The Home Depot’s Atlanta, Georgia, Store Support Center. via AR Newsline – News – Amateur Radio Newsline Report 1968 July 17, 2015. In episode 5 we talk about Current. What it is, who named it, how to and how not to measure it. More questions and answers from the Technical class question pool. Average daily sunspot numbers dropped from 109.1 on July 2-8 to 73.7 in the past week, July 9-15. Average daily solar flux dropped from 123.2 to 114.8 over the same two periods. Geomagnetic indices were more active, with average daily planetary A index increasing from 10 to 13.7, and average mid-latitude A index going from 8.9 to 12.3. The geomagnetic field was active on July 11 when the mid-latitude A index, the high latitude college A index, and planetary A index were 20, 44 and 23. Activity was greater on July 13 when the three indices were 22, 45 and 32. The July 11 activity was a G1 class geomagnetic storm caused by a high-speed solar wind stream, and similar events caused the July 13 activity. Currently there is very little chance of solar flares or geomagnetic storms over the next few days. Predicted planetary A index is 8 on July 17-18, 10 on July 19-20, 5 on July 21-30, 18 on July 31, 25 on August 1, and 12 on August 2. On August 3-5 the planetary A index is predicted at 5, then 20 and 25 on August 6-7, and 8 on August 8-10. On August 11 and beyond the planetary A index prediction is 5. Predicted solar flux is 100 on July 17-19, 95 on July 20-21, 100 on July 22-23, 105 on July 24, 110 on July 25, 115 on July 26, 120 on July 27-31, and 115 on August 1-4. Solar flux is expected to rise to 120 again after August 22. Recently there have been only a few new sunspot groups, one each on July 7, 8, 10 and 12 and two on July 16.